Horsetail is a perennial plant that is found in or near watery areas such as marshes, streams, or rivers. Horsetail grows in temperate northern hemisphere areas of Asia, Europe, North America, and North Africa. It flourishes where it can root in water or clay soil. Horsetail is a derivative of larger plants that grew 270 million years ago during the carboniferous period. It belongs to the Equisetaceae family and is a relative of the fern. There are over 20 species of horsetail. The species most commonly used medicinally is field horsetail (Equisetum arvense). E. arvense grows up to 1.5 ft (0.5 m) in corn fields and wet meadows. Wood horsetail (E. sylvaticum) grows in copses and on hedgebanks, usually to a height of 1-2 ft (0.3-0.6 m). This species is used as food for horses in parts of Sweden. River horsetail (E. maximum) is the largest of the European species of horsetail. Found in bogs, ditches, and on banks of rivers and ponds, E. maximum grows to a height of 3-6 ft (1-2 m). Horsetail has no leaves or flowers and grows in two stages. The first stage occurs during the early spring. At this time, a fertile hollow stem appears that resembles asparagus. After these stems have withered and died, the second stage begins. During this stage, which occurs during the summer months, thin green barren stems branch out from the plant. It is during this stage that horsetail is gathered for medicinal use. 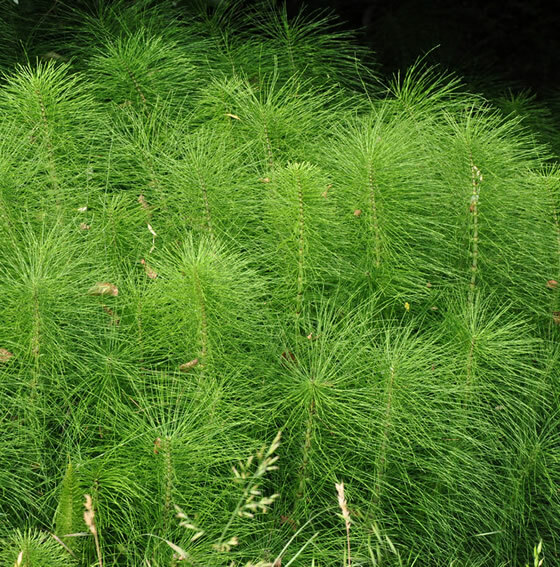 Horsetail was named for its bristly appearance. The genus name Equisetum is derived from the Latin words equus, meaning horse, and seta, meaning bristle. Other names for horsetail include shave-grass, bottle-brush, and paddock-pipes. Horsetail contains silicon, potassium, aluminum, manganese, saponins, phytosterols, phenolic acids, cafeic acids, alkaloids, and tannins. Fifteen types of bioflavonoids are also present. These bioflavonoids are believed to be responsible for horsetail’s strong diuretic action. The high silicon content of the herb strengthens connective tissue, ligaments, bones, hair, and fingernails. The medicinal use of horsetail dates back to ancient Roman and Greek times. The Greeks used horsetail as a wound healer, a diuretic, and an agent to stop bleeding. Nicholas Culpeper, a popular seventeenth-century herbalist, wrote of horsetail’s beneficial properties in stopping bleeding, and treating ulcers, kidney stones, wounds, and skin inflammation. In the nineteenth century, horsetail was also used to treat gonorrhea, prostatitis, and urinary incontinence. The North American native peoples used horsetail to treat a number of kidney and bladder ailments. The Cherokee used horsetail to aid the kidneys. Chippewa natives made a decoction out of horsetail stems and used it to treat painful or difficult urination. The Okanagan-Colville and Potowatami peoples made a horsetail infusion as a diuretic to aid kidney function. Horsetail’s reedy exterior and silica content have made it a popular metal polisher and natural abrasive cleanser. One species is so rich in silica that it was imported from Holland for the purpose of polishing metal, hence the nickname Dutch rushes. Another nickname is pewterwort, so named because it was used to scour pewter. Dairy maids of England used horsetail to scour their milk pails, while early Americans used it to scrub their metal pots and pans. 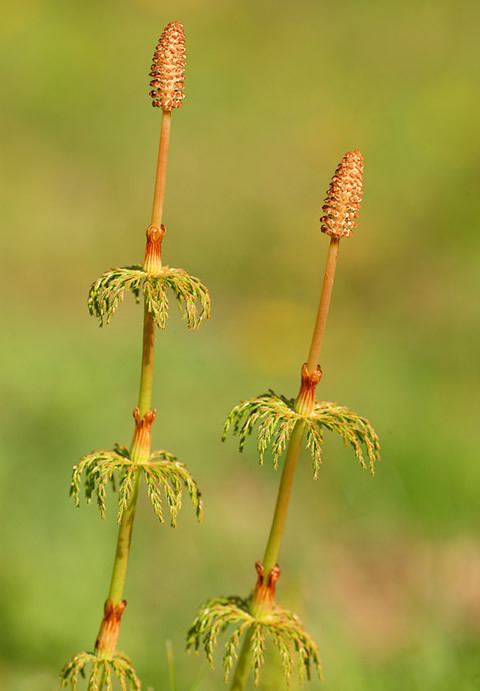 Horsetail has been used internally and externally as a folk medicine to treat rheumatism and gout, coughs and asthma, acne, brittle hair and fingernails, and as a blood purifier. Shoots of a larger species of horsetail were sometimes eaten by the poorer classes, although the food lacked taste and wasn’t very nutritious. Herbalists still use horsetail to treat a variety of kidney and bladder problems. Horsetail has properties that help bladder and kidney tissue. Its tonifyng effects help to reduce inflammation in such conditions as kidney stones, bladder and kidney infections, weak bladder, weak kidney, and urinary incontinence. The German Commission E has approved horsetail as an effective treatment for kidney and bladder inflammations, edema, urinary tract infections, and bacterial infections. It is also used as a component in diuretic drugs. Horsetail is rich in minerals, particularly silica deposited in its stems. Silica helps to promote the body’s absorption of calcium, an important component in tissue repair and bone and cartilage formation. Horsetail’s silica and silicic acid content ranges from 5-8%, making it a good source for strengthening weak connective tissues, and healing bones, fractures, and torn ligaments. Horsetail is also used to treat arthritis and osteoporosis, as the silicon in horsetail may replace lost silicon in the affected bones. Horsetail may be a possible remedy for senility. Senility often occurs when there is more aluminum in the blood than silicon. One theory suggests that when the silicon and aluminum levels are balanced, the symptoms of senility will disappear. Horsetail’s ability to stop blood flow has made it useful in treating nosebleeds, internal bleeding, heavy menstrual bleeding, bleeding hemorrhoids, and bleeding wounds. Often a compress made from fresh horsetail juice is placed on the wound to stop the flow of blood. The healing effect may be strongest when horsetail is taken both internally and externally. Horsetail is also used to remedy brittle nails, bleeding wounds, hair loss, cystic ulcers, rheumatoid arthritis, gout, gonorrhea, digestive disturbances, bronchitis, lung disorders, tuberculosis, poor teeth and gums, varicose veins, and fallen arches. Skin ailments such as sties, rashes, itchy eczema, or eye inflammation may be treated with an external compress made from horsetail tea. Horsetail is gathered in the spring and early summer, after the fertile stems have died and the barren shoots have grown. The plant is cut above the root and the stems are used dried or fresh. 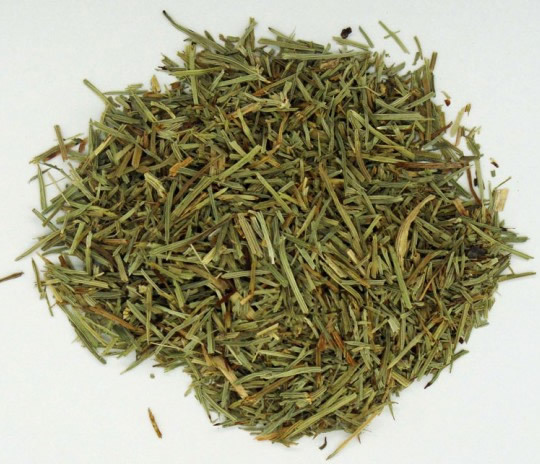 Horsetail is available in dried bulk, powder, capsules, tablets, or tincture forms. It is recommended that commercial preparations of horsetail contain no more than 3% blackish rhizome fragments and no more than 5% stems or branches from other horsetail species. Standard preparations generally contain 10% silicic acid and 7% silica. Taken as a dietary supplement, horsetail is a good source of calcium and silica. Horsetail can be made into a tea (infusion or decoction) and consumed internally. Horsetail may also be used in full body baths, sitz baths, foot baths, compresses, hair rinses, and poultices. For the capsule form, two capsules can be taken with water up to two times daily. To make a tea, 1 cup of boiling water can be poured over 2 tsp of dried horsetail and steeped for 15 minutes. Up to 4 cups of the cold tea can be drunk daily for bladder or kidney ailments. The tea may be used externally as a hair rinse for dandruff or an oily scalp. About 10-60 drops of the tincture can be used daily. Pregnant or nursing women and people with severe kidney or liver disease should consult their health practitioner before using horsetail. People with high blood pressure or heart problems should not take horsetail. Horsetail contains low levels of nicotine and may not be safe for young children. Horsetail shouldn’t be taken internally for more than three days, and people should not take more than the normal dosage. Long-term use or high doses of horsetail have caused irreversible kidney damage due to too much silica. It is best to follow dosage guidelines and use properly harvested horsetail since the older shoots are higher in silica. Commercial preparations that are processed at high temperatures are recommended since the heat destroys a potentially harmful enzyme, thiaminase, found in crude horsetail. When horsetail is gathered for medicinal use, plants with brown spots aren’t collected. Brown spots may indicate the presence of a toxic fungus. Horsetail that grows near an industrial or waste site or in heavily fertilized areas should not be harvested since it can pick up nitrates and selenium from the soil. The correct species of horsetail should be collected. Marsh horsetail (E. palustre) is poisonous. Severe side effects that may require medical attention are kidney pain, lower back pain, pain while urinating, nausea, or vomiting. These symptoms may signal kidney damage. Heart palpitations can occur if horsetail is overused. If this happens, immediate medical attention is required.